The Handbook of Sociology of Aging is the most comprehensive, engaging, and up-to-date treatment of developments within the field over the past 30 years. The volume represents an indispensable source of the freshest and highest standard scholarship for scholars, policy makers, and aging professionals alike. The Handbook of Sociology of Aging contains 45 far-reaching chapters, authored by nearly 80 of the most renowned experts, on the most pressing topics related to aging today. With its recurring attention to the social forces that shape human aging, and the social consequences and policy implications of it, the contents will be of interest to everyone who cares about what aging means for individuals, families, and societies. The chapters of the Handbook of Sociology of Aging illustrate the field's extraordinary breadth and depth, which has never before been represented in a single volume. Its contributions address topics that range from foundational matters, such as classic and contemporary theories and methods, to topics of longstanding and emergent interest, such as social diversity and inequalities, social relationships, social institutions, economies and governments, social vulnerabilities, public health, and care arrangements. The volume closes with a set of personal essays by senior scholars who share their experiences and hopes for the field, and an essay by the editors that provides a roadmap for the decade ahead. 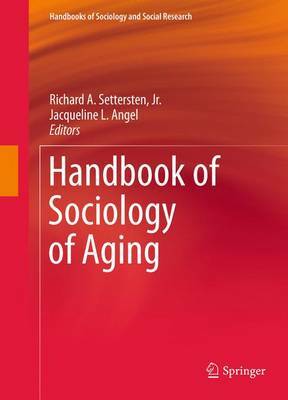 The Handbook of Sociology of Aging showcases the very best that sociology has to offer the study of human aging.